Pune, the official kit supplier of Uruguay has unveiled the new kit for Copa America 2016. Taking inspiration from home colors, the jersey and shorts are designed just brilliantly that makes it different from the others. It will be first worn during match in March 2016. So have a look on new Uruguay kit for upcoming football competition. 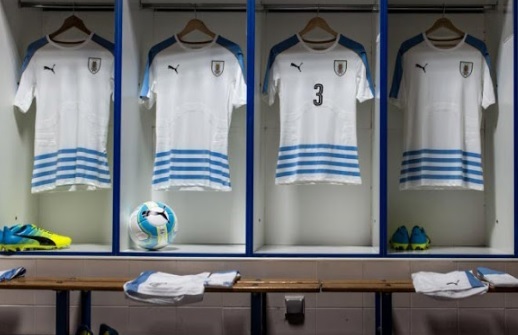 Jersey: The all new home jersey of Uruguay for Copa America 2016 is mainly sky blue in appearance. In addition with home color, black appearance is interestingly featured. Front of Uruguay 2016 home jersey is designed with national team crest badge in white and golden appearance next to Puma logo. Shoulders are provided with a black wide tripe on which Puma sign is there in blue appearance. 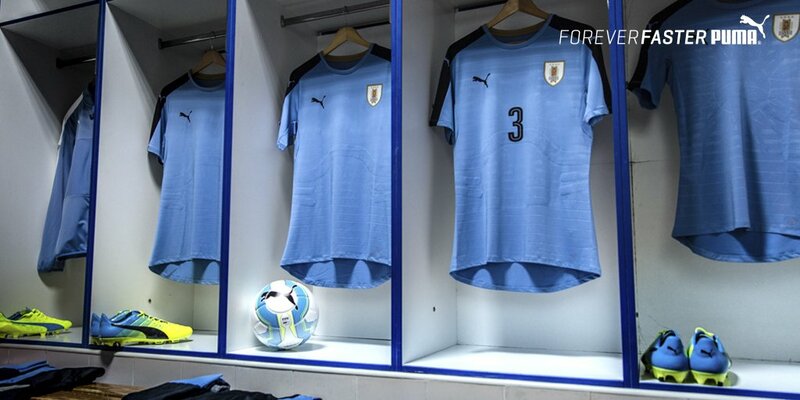 Uruguay 2016 home kit is almost completely blue with a simple round. This lightweight jersey helps in maintaining the body temperature during severe condition. The home kit is inspired by the Sun of May, a ‘La Celeste’ graphic is also present inside of the shirt. Shorts and socks: Home shorts are built with the color combination of Black and sky blue. While socks are also designed using these two colors. 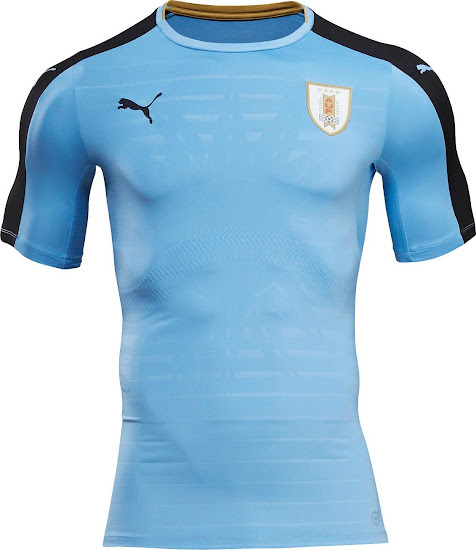 Jersey: The all new Uruguay 2016 Copa America Centenario away kit is based on Puma’s Euro 2016 kits. It is mainly designed with white in addition with royal blue applications. Team’s bade and Puma’s trademark logo are one same spot. Classical crew neck white collars are looking great with a golden stripe inside the jersey. Arms are provided with blue lining with black Puma logo. At the bottom of jersey, four blue stripes are drawn representing the national flag of Uruguay. 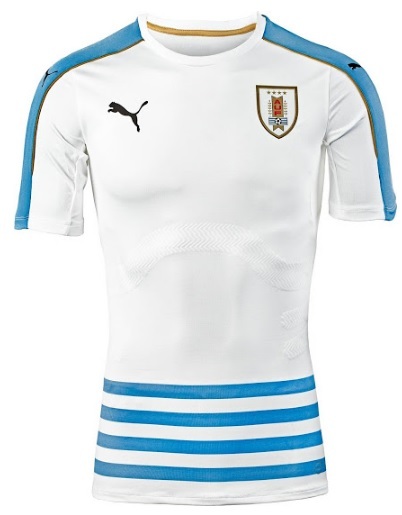 Shorts and socks: White shorts and socks completes the away kit of Uruguay for Copa America 2016 Centenario. Uruguay are one the most successful team in Copa America football competition. In this edition, Uruguay are in Group C with Gold Cup winners Mexico, Jamaica and Venezuela. They will play the first group stage game agaisnt Venezuela at Soldier field Chicago. So this is the new Uruguay 2016 Copa America kit. What are your views on this new launch of Puma?